Spend the day on Morocco’s Atlantic coast with a full-day, private trip from Marrakech to Agadir, where you’ll find a historic palace, a breezy waterfront promenade, and lots to explore. 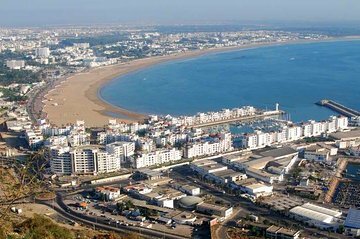 Booking a private tour from means you’ll have the flexibility to customize the day to your preferences, with the option to add a boat trip, relax on the beach, or just wander the fascinating Agadir fish market. All transport is by climate-controlled minivan, and flat-rate pricing is available for groups of up to eight people. This was by far one of the best days that my friends and I had in Marrakech. First, Said, the gentlemen who coordinates the rides is very courteous and helpful. He not only responded to any questions we had promptly but offered to support us in other areas of our stay in Marrakech. On the day of our tour, we were picked up promptly in a comfortable mini-van and taken to Lake Takerkouste. The ride to this destination was approximately 45 mins. Once we arrived at the riding site we were all given head caps, helmets, and a quick mini-lesson of how to use the quad-bikes. Hassan, one of the drivers, took us to a small area to practice before we got to the desert hills. After the practice we drove off to the hills. It was both beautiful and exciting. We were stopped at two different locations to take pictures - one near the summit of the hills and another near the lake. Finally, half-way through our ride we were taken to a small home for tea and cookies - both of which were very delicious. Everything was breath-taking and throughout it all Hassan was patient, helpful, and constantly looking out for all members of our tour. In fact, he even took the extra step to ride around with one of my peers on the back of the 4X4 because she was uncomfortable driving it herself. All the gentlemen that run this tour are respectful, kind, and patient. And the experience itself was just amazing. I would recommend this tour and plan on taking it again with other friends if I visit Marrakech again.